Taoism and how it influenced Japan's religious and artistic heritage. The teachings of the Chinese sage Lao Tzu (−5th or −4th centuries). The impact of Taoism on the philosophic mindset and artistic heritage of China and Japan is impossible to exaggerate. Taoism (Jp. = Dōkyō 道教) is one of three great philosophies of China. The other two are Confucianism (Jp. = Jukyō 儒教) and Buddhism (Jp. = Bukkyō 仏教). Curiously all three developed at approximately the same time. Buddhism originated around −500 in India with Shakyamuni (Jp. = Shaka 釈迦), the Historical Buddha. His teachings entered China around the +1st and +2nd centuries, where they later flourished. Shakyamuni’s contemporaries in China were Confucius 孔子 (Jp. = Kōshi) and Lao-tzu 老子 (Jp. = Rōshi). Lao-tzu is known as the founder and "old boy" of Chinese Taoism, for legend says his mother carried him for 80 years before giving birth, and that he was born with white hair because of this. Hence, his name, which literally means “Old Boy.” Most scholars believe he lived at the time of Confucius, and even met Confucius, but some modern researchers contest this, claiming that Lao-tzu is a fictitious character. They suggest that Taoism’s oldest teachings, those recorded in the Tao Te Ching 道德經 (Jp = Dōtoku kyō, Ch = Dàodé jīng), were written in the 4th century BC by several hands. This debunking of Lao Tzu is not set in stone, and a firm judgment is impossible to make. 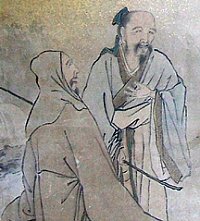 This web site presents Lao Tzu as a real person, and considers it very likely that he alone is the author of the Tao Te Ching. still serve as primary themes in calligraphy in China and Japan. Confucianism is not generally considered a religion or practiced like a religion, nor did it inspire great schools of art, as did Taoism and Buddhism. Rather, Confucianism developed as a set of ethical and political tools, a basket of norms that emphasized filial piety, respect for elders, social obligations, and rules of courtesy that promised humanistic, rational, and benevolent governance, harmonious family relationships, and clear-cut standards for governing the interaction among rulers, lords, vassals, and common folk, between old and young, father and son, husband and wife, etc. 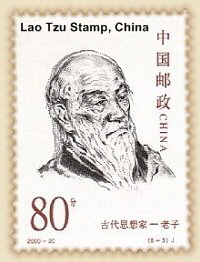 Over many centuries, it developed into an overarching set of moral laws, and for centuries served as the basis of China’s all-important civil examinations, which stressed the value of Confucian learning and the importance of scholarly officials (learned statesmen) who would lead by virtuous example. Confucianist concepts still serve as an important focus of calligraphic practice in China and Japan. Even today, numerous artists in both nations pursue calligraphy as their main profession. Their art is often focused on the key terms appearing in the Confucian classics (see slideshow above). Calligraphy, however, is not considered a Confucian art, but rather an art that draws its inspiration from the “individualistic” and “mystic” traditions of Taoism. Analects 15:23. Confucius stressed a set of rules (rituals of courtesy 禮) that all should respect. If people followed these rules, social relationships would become harmonious. But doing so also required a heightened sensitivity from the rulers and the ruled. It required benevolence (仁) and tolerance (恕), of putting oneself in the shoes of others. Confucius stated the golden rule well before the Christians: "What you do not wish upon yourself, do not impose on others." The main teachings of Confucius are recorded in the Analects 論語 (Chn. = Lùnyǔ, Lunyu; Jp. = Rongo), compiled by his disciples. Confucius is also credited with authoring the Spring and Autumn Annals 春秋 (Chn. = Chun Qiu or Ch’un Ch’iu) and with editing the classic Book of Poetry 詩經 (Chn. = Shi Jing or Shih Ching). 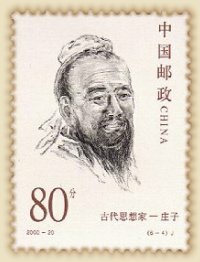 Confucianism was further developed in later centuries by other Chinese scholars, most notably Meng-tzu 孟子 (Mencius −372-289) and Hsũn-tzu 荀子 (−298-238). In Japan, as earlier in China, Confucian ideals played a major role in the development of ethical and political philosophies. This was especially so during Japan’s formative years (+ 6th to 9th centuries), when Confucianism and Buddhism were introduced to Japan from Korea and China. Prince Shōtoku Taishi 聖徳太子 (+ 547 to 622), the first great patron of Confucianism and Buddhism in Japan, enacted a 17 article constitution that established Confucianist ideals and Buddhist ethics as the moral foundations of the young Japanese nation. This served for centuries as the Japanese blueprint for court etiquette and decorum. Much later, in Japan’s Edo Period 江戸 (+1600 to 1868), also known as the Tokugawa 徳川 era, Confucian ethics experienced a revival of sorts. During the period, a revised form of Confucianism, called Neo-Confucianism (Jp. = 朱熹学 Shushigaku), gained great appeal among the warrior class and governing elite. Neo-Confucianism brought renewed attention to man and secular society, to social responsibility in secular contexts, and broke free from the moral supremacy of the powerful Buddhist monestaries. Most modern scholars consider Neo-Confucianism to be the keynote philosophy of Tokugawa Japan, one that originated with Zhu Xi 朱熹 (+1130-1200; Chu Hsi), a Chinese scholar of China’s Southern Song period. His teachings were brought to Japan by Japanese Zen monks who had visited China in the +15th and +16th century. Zhu Xi stressed the "unity of the three creeds," the unity of the three great philosophies of Buddhism, Confucianism, and Taoism, which had until then been considered mutually exclusive and contradictory. This three-way unity was called Sankyō 三教 in Japanese (Chn. = Sān Jiào), and literally means “Three Religions.” In Chinese and Japanese artwork, it spawned the pictorial theme known as the Three Patriarchs, along with two other related themes (see next section), each emphasizing the notion that “the three creeds are one.” In Japan, some prefer an alternative trio that includes Shintō, Confucianism, and Buddhism. As discussed above, Neo-Confucianism emphasized the unity of Confucianism, Buddhism, and Taoism (Jp. = Sankyō Itchi 三教一致, literally Unity of the Three Creeds). This doctrine sparked the emergence of three related themes in Chinese and Japanese painting. These three themes became popular subjects of Chinese painting during the Southern Song and Yuan periods, and gained popularity as well in Japan during the Muromachi 室町 (+1392-1568) and Edo 江戸 periods (+1600 to 1868). 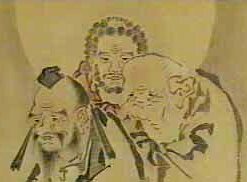 In Japanese paintings, the three patriarchs -- Confucius (Confucianism), Buddha (Buddhism), and Lao-tzu (Taoism) -- are portrayed together, often in a lighthearted manner, to reflect the ecumenical Neo-Confucian doctrine. Chinese = Sān Jiào. Among the best-known Japanese paintings of the trio is that by the Japanese Zen priest Josetsu 如拙 (+1386?-1428? ), a treasure of Ryousokuin Temple 両足院 in Kyoto. 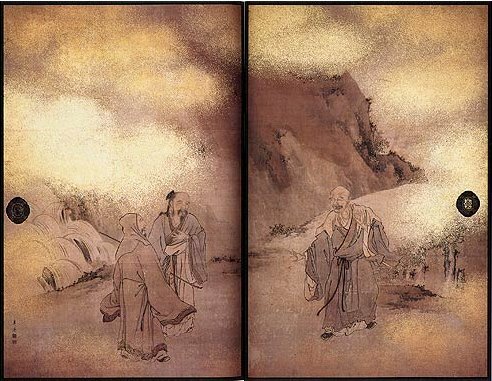 Three Sages Tasting Vinegar (see above) is a popular theme in Chinese and Japanese art. One important variation on this theme was to show each of the three patriarchs with different facial expressions. 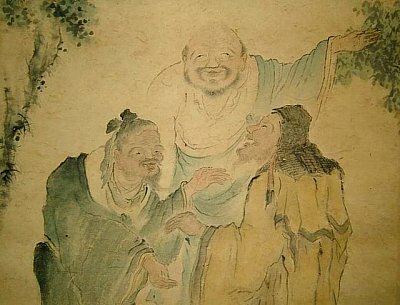 After tasting the vat’s content, Confucius is shown with a sour face, Shakyamuni (Buddha) with a bitter expression, and Lao tsu with a smiling face. This painting theme is allegorical. Since each represents one of the three great philosophies of China, each wears an expression appropriate to that philosophy. To Confucius, the father of Confucianism, life was sour and chaotic because rules and regulations were not strictly obeyed. Indeed, the typical Chinese Confucian scholar pursued a very harsh lifestyle -- little laugher came forth from the study. This rigidity is captured nicely in an old Chinese saying about Confucius: "If the mat is not straight, the Master will not sit." To Shakyamuni, the Historical Buddha and the patriarch of Buddhism, life was bitter, filled with suffering, sickness, old age, and death. Shakyamuni believed that suffering originated from desire and attachment, and to overcome suffering one had to overcome worldly desire. Lastly we have the smiling face of Lao Tsu, the father of Taoism, whose philosophy is to “flow like water,” to live in harmony with life’s circumstances, to turn the negative into the positive, to refrain from making quick opinions about good and bad. Life is sweet, not sour or bitter, if one flows like water, without trying to dam, redirect, or interfere with the natural path of the water (stream of life). Confucianism failed to inspire any great schools of art in Japan, nor did it become a religion or gain a religious following. Yet it greatly influenced social behavior. Confucian concepts are still clearly evident in modern Japanese society, but most Japanese people don’t recognize them as such, as modern Japan has dressed itself predominately in Shinto and Buddhist garb. Below are a few examples of Confucian influences in modern Japan. Most Japanese homes still keep ancestral tablets (ihai 位牌) and altars (butsudan 仏壇) in their homes, which record the posthumous names of deceased family members and allow families to pay homage to their ancesters. Butsudan appeared in the private homes of Japan’s aristocracy at an early date, and became widespread among upper-class families during Japan’s Kamakura (+1185-1333) and Muromachi periods (+1392-1568). The placing of ancestral tablets inside the butsudan is generally considered a Confucian influence. More more details, see JAANUS. Modern Japan exhibits many characteristics of a well-functioning Confucian society. Singapore is another oft-quoted example of a healthy Confucian nation-state. The warrior code was influenced by Confucianism, Zen Buddhism and Shinto. Confucianism engendered filial piety and loyalty to one's lord. Zen helped the warrior control body / mind and overcome fears of death. Shinto brought emperor worship. Japan is home to many Buddhist temples and Shinto shrines, but only a small number of locations are devoted to the Chinese sage Lao Tsu. NEED TO ADD THIS SECTION. Confucius Lives Next Door (Jump to Amazon). Book by author T.R. Reid, March 2000. Reid identifies the positive influence of Confucian ethics on East Asian cultures, especially in Japan. Reid spent five years in Tokyo (with his wife and two children) as the Tokyo Bureau Chief for the Washington Post, and is an NPR commentator. Reid credits Asia's success to the ethical values of Confucianism, which teaches the value of harmony and the importance of treating others decently. A place for Confucian Learning in the Edo Period. Shizutani school says it was the oldest free public school in Japan. It was a Confucian school, dedicated to family, respect for elders and superiors, and discipline. It provided education to the local children. In those days, only the children of elite families had the wherewithal to receive an education. Closeup. See full scroll painting below. The following books have been written by Professor Jerry Alan Johnson and contain translated texts from ancient Zheng Yi Daoist Mysticism. Also read Basuusen. "Basu, the Immortal, sennin 仙人." An Indian sage, whose Sanskrit name, Vasu, may be an alternative name for one of the Seven Rishi, or "seers." Basusen appears as an Indian ascetic who, with *Kichijouten 吉祥天, flanks *Senju Kannon 千手観音 in the *Taizoukai mandara 胎蔵界曼荼羅. Thus he often appears, along with Kichijouten (although sometimes replaced by Kudokuten 功徳天, a form of Kichijouten), in paintings of Senju Kannon. Basusen is also one of the *nijuuhachi bushuu 二十八部衆, the Twenty-eight Attendants of Senju Kannon. He usually appears either as an ascetic or as a fully dressed old man, and carries a text, usually a palm-leaf book. The later is a symbol of the Prajnaparamita texts, HANNYAKYOU 般若経; the sutra of The Perfection of Wisdom, which is central to the attainment of enlightenment and therefore to all forms of Buddhism. Basusen is a protector of these texts and, as such, appears in paintings such as the images of *juuroku zenshin 十六善神, along with other protectors. Taoism was also introduced during the Asuka period. In the mid-7th century, Empress Saimei built a Taoist temple at Mt. Tōnomine (多武峯談山). Many stone turtles (亀石, kameishi), a form common among Taoist sites, have been discovered in Asuka and are assumed to have been created during Saimei's reign. The octagonal shape of monarchs' tombs of this age and the celestial maps drawn in Kitora and Takamatsuzuka also reflect the Taoist cosmology. Tennō (Emperor), the new title of the Japanese monarch in this period, could also be argued to derive from the name of the supreme God of Taoism, Tenko-Taitei(天皇大帝), the God of Polaris . Taoist belief was eventually amalgamated with Shintō and Buddhism to establish new styles of rituals. Onmyōdō, a sort of Japanese geomancy and cosmology, is one of the fruits of those religious mixtures. While the Asuka period started with conflict of religious belief between clans, later in the period, the imported religions became syncetized with Japan's native folk beliefs. In India, forest dwelling, world-renunciant religious practitioners. The theory that his soul went to India and was reborn as the Buddha is found in the 齊書 History of the Qi dynasty 顧歡傳." To most casual observers, Japan is a land of Shinto shrines and Buddhist temples. Yet, just beneath the surface, one can easily uncover the mystical traditions and mysterious folk beliefs of Chinese Taoism. Taoism, even today, influences Japan's philisopical and religious traditions, its artwork, festivals, and superstitions. This page provides a brief overview of Chinese Taoism, but its main focus is to introduce various Japanese traditions that clearly incorporate Taoist notions -- notions that continue to color and influence modern Japanese practices, but which are dressed entirely now in Buddhist garb. .
Chinese Taoism and how it influenced Japan's religious and artistic heritage. Taoism in Japan. Its impact on Japanese art, philosophy, religion, and modern-day superstition. Confucianism and Taoism are two other religious “imports” that have played important roles in Japanese society over a period of more than 1,000 years. Confucian precepts had a major influence on Japanese ethical and political philosophy in the formative period of the Japanese state (the 6th to 9th centuries), and again in the Edo period (1600–1868). Harder to trace than that of Confucianism, the influence of religious Taoism in Japan can be found in the use of the Chinese calendar and in popular beliefs such as those concerning fortune-telling and auspicious directions. Ch: suihan sanyou. Lit. the three friends of winter. A painting theme featuring pine (matsu 松), plum (ume 梅) and bamboo (take 竹), all of which retain their vigor during cold weather. Before their combination, each of the "three friends" was already a well-established subject with Chinese painters. The pine was associated with chastity, the bamboo with uprightness, and the plum with purity and renewal. The plants embody the ideals of the Confucian scholar-official who endures tenaciously in spite of adversity. For Confucian scholars, adversity often came in the form of allegiance to the old order after a dynastic change in rule. For these "left-over subjects" (Ch:yimin 遺民) the saikan sanyuu held a particular meaning especially from the fall of the Northern Song dynasty,the coming of the Yuan and later the Northern rule of the Ching dynasty. The origin of the theme is thought to relate to a line in the Confucian Analects (Ch: LUNYU 論語; Jp: RONGO ) which reads saikan shouhaku 歳寒松柏 or "in the winter the pine and cypress." In Japan the earliest examples of the saikan sanyuu date from the Muromachi period and are well-represented in the painting of Gyokuen Bompou 玉えん梵芳 (act. early 15c). The theme was also a favorite of *nanga 南画 artists. .
Dragons figure importantly in popular folk beliefs and Taoism, often serving as a vehicle for immortals. altogether unlike the more common expositions on Taoism that speak superficially of Yin and Yang, the I Ching, quote Lao-Tzu or Chuang Tzu, and endlessly list Taoist proverbs. Daoist folk beliefs like the sacrifice to the Stove God, Earth God, City God, Mazu and Emperor Guan are still kept in Chongsun county. Taoism first came to Japan during the sixth century A.D. though, while elements of both 'Religious Taoism' and at a later date, 'Philosophical Taoism' have had an unmistakable influence on Japanese religion, Taoism as a distinct, institutional tradition, never really gained a following amongst the Japanese people. However, beliefs concerning the 'Taoist Immortals' and Taoist Paradises were 'adopted-in' to various streams of Japanese folk belief and mythology, along with Taoist mystical and medicinal practices. For example, the koshin-machi, a popular Japanese all-night vigil undertaken as part of a longevity disciplines, is based on Taoist belief. Also, elements of Taoist magic exist in Shinto practice, and more noticeably in the mountain-centred ascetic disciplines of Shugendo. But probably the most important expression of Taoism in Japan was the ritualistic tradition known as onmyodo. Central to onmyodo were the disciplines of astrology and Taoist Five-Element theory. In onmyodo philosophy there was no particular concern with (or belief in) life after death. It's primary focus was on the identification and avoidance of troubles and disharmonies in the here-and-now. Through an understanding of the natural laws of the universe, and through the application of ritualistic practice based on yin-yang/five-element theory, onmyodo sought to bring order to a world perceived as being, in the main, completely chaotic. Originally, onmyodo was closely aligned with the Imperial Household, and matters of state. The onmyodo practitioners were consulted on everything, from the siting of the imperial capital, to the performance of state ritual, the interpretation of supernatural signs, and, most importantly, divining the fate of Emperors, Courtiers, and the nation. Over the centuries, however, the various arts and practices of onmyodo gradually became absorbed into Shinto and Buddhist tradition, and also into the disciplines of the shugenja, and other ascetic groups, to the point where onmyodo - as a distinct tradition in it's own right - to all intents and purposes ceased to exist. Today, the term onmyodo is unknown even amongst many of those people who, under a different name, practice the various surviving elements of this ancient mystical, curative, and magically ameliorative tradition. Many people think Taoism origins in a legendary Chinese philosopher Lao Zi. Though, it is not accurate. I can say that the Tao philosophy of Lao Zi is one component of Taoism, but not all. I cannot tell what Taoism is. It is a too vague concept. If I have to say something, I'd say that Taoism is a mixture of native religions of ancient Chinese, divination, Confucian courtesy and ceremony, Buddhism introduced from India, and the Tao philosophy of Lao Zi and Shuang Zi.'' Though Taoism is not popular in Japan, it had influenced over Japanese culture. So I'll explain its outline briefly. Tao Philosophy : The Tao philosophy is based on the books written by Lao Zi and Shuang Zi. 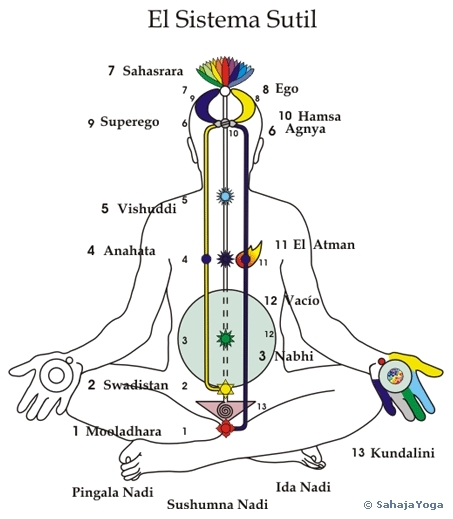 The text of the books are too vague, so that ten readers can make eleven interpretations. So numerous annotations about the books have published ever since (some of them contradict each other of course). I won't say I understand it. But you seems to expect I'll give some information about the philosophy, I'll write some. The Tao philosophy assumes a being beyond human sense, a universal oneness containing everything in itself, called Tao. Tao is translated as ``the way'' traditionally. Anyone cannot get to Tao through shrewd intelligence or deep meditation. The only way to Tao is to live naturally. Oh, yeah, it is debatable what naturally means. Living in the wild? I don't think so. Abandoning all greed? It's important but not enough. Think by yourself! Tao philosophy is not popular in Japan. I think it was too difficult and idealistic for Japanese mentality. However, it have affected more or less to Japanese culture. Japanese has the concept of Do, which means ``the way.'' I think it a far descendant of Tao in Chinese. Chinese Divination : Ancient Chinese divined by the cracks on burned bones and turtle carapases. To record the cracks they invented characters, which is said to be the ancestor of Han characters. 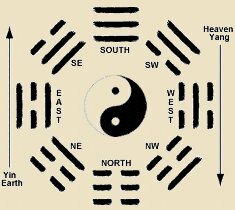 Since then they had invented numerous method for divination, such as astrology, calender, house plan and direction, physiognomies etc.. Taoism inherited the long tradition of Chinese divination. In Japan it was inherited by Onmyo-Do. Confucian courtesy and ceremony : Coufucius is the world famous Chinese philosopher ciaca 500 BC. His philosophy is very popular in China, Korea and Japan, so it will be explained on another page (not available now, but soon...). At this point, we should note that he made much of courtesy and traditional ceremony. This part of his teaching was inherited by taoism. Taoism have numerous ceremonies such as ancestor worship etc. 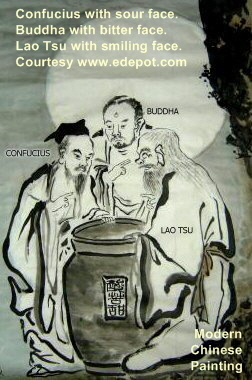 Buddhism legends : Taoism inherited many legends from Buddhism and Hinduism. Many Buddhism/Hinduism deities appeared in Taoism legends. They coexisted with Cerestial Emperor (native Chinese religion) and deified Lao Zi. Taoism itself had little aspect of self-enlightment. Alchemy : Alchemy was popular among Taoists, though it was much different from Arabian/Europian alchemy. Chinese alchemists aimed at longevity pill rather than gold (pill was the more common form of medicine than liquid potion). Emperors of Chinese dynasties wanted to attain immortality, so alchemists made various pills from quicksilver, arsenic, etc.. It was unfortunate that Chinese alchemy couldn't develop modern chemistry. Sennin : It was widely believed among Taoists that a man could attain immortality by achieving Tao. Such the immortal were thought to have fantastic abilities such as living without any foods, flying with clouds, etc.. Though Taoism was not popular in Japan, mideival Japanese believed in the immortal taoists. They were called Sennin in Japanese (sorry, I forget what they were called in Chinese). At first, immortality was the prize only for those who had achieved Tao. However, taoists began to want immortality without achieving Tao. So many legends were bore to become Sennin. Some thought there had been a special pill which had made taker into Sennin (how easy idea!). Some other thought to become Sennin by fasting because a Sennin could live without food. Some other thought the way to Sennin is known only by real Sennin, so they had to find Sennin and learn the secret. There were much more other hypothesis how to become Sennin. A Sennin was described as a hermit living in the wild, who lived on mist. Ch: baxian. Lit. eight immortals. The eight figures considered to be the experts in and protectors of Taoism. 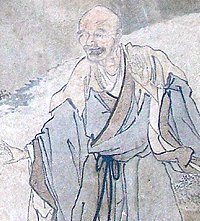 The impetus for creating a group of eight legendary Taoists was probably an attempt to compete with the popular "sixteen arhats" *juuroku rakan 十六羅漢 of Buddhism and is also related to Du Fu's 杜甫 (Jp: To Ho, 712-70) famous poem "Eight Immortals of the Winecup" (Ch:Yinzhong baxiange, see *Inchuu hassen 飲中八仙). Accounts and depictions vary, but generally the semi-legendary figures are: *Shou Riken 鍾離権 (Ch: Zhong Liquan), who was master of *Ryo Douhin 呂洞賓(Ch: Lu Dongbin), and is usually shown wearing a large cloak and waving a plumed fan; Chou Karou 張果老(Ch: Zhang Guolao); Kan Shoshi 韓湘子 (Ch: Han Xiangzi), nephew of the great 9c poet Han Yu 韓愈 whom he impressed with feats of magic such as making a peony burst; Tekkai (see *Gama Tekkai 蝦蟇鉄拐); Sou Kokkyuu 曹国舅 (Ch: Cao Guojiu), brother of an 11c Song empress, who, to escape the persecution of an elder brother, fled into the mountains where he was taught by Ryo Douhin and is usually depicted in the costume of a government official holding a tablet of state; Ryo Douhin, Ran Saika 藍采和 (Ch: Lan Caihe), originally a Nanjing 南京 actress named Xujian she was converted to Taoism by Shou Riken and is represented begging or singing in the marketplace holding large wooden-clappers or a flute and dressed in a tattered green gown; and, Ka Senko 何仙姑 (Ch: He Xiangu), a female ascetic taught by Ryo Douhin who gave her the peaches of immortality, which were the source of the immortality of those residing in Taoist heaven, she is often depicted wearing elegant clothing and holding a long lotus flower. The hassen theme was more popular with both Chinese and Japanese artists than with ordinary Taoist believers, although Japanese painters frequently confused the identities of the lesser-known immortals. There are notable Japanese paintings by Kaihou Yuushou 海北友松 (1533-1615) and Kanou Sansetsu 狩野山雪 (1589/90-1651). Paintings of the hassen were popular with 17c and early 18c Kanou painters. Ch:Huxi sanxiao. An allegory in which three Eastern Jin 東晋 literati realize by accident that spiritual purity cannot be measured by artificial boundaries. One day the poet Tao Yuanming 陶淵明 (Jp: *Tou Enmei, 365-417) and the Taoist Lu Xiujing 陸修静 (Jp: Riku Shuusei, 406-477) traveled to the Donglin 東林 temple on Mt. Lu 廬山 to visit the Buddhist theologian Huiyuan 慧遠 (Jp: E On, 334-416) who lived there as a recluse, vowing never to cross the stone bridge over the Tiger Ravine (Kokei 虎渓) that marked the boundary of the sanctuary. After an evening together, Huiyuan accompanied his friends as they left the temple. Deeply absorbed in conversation, Huiyuan inadvertently walked with them across the Tiger Ravine bridge. When the men realized what had happened they broke out in spontaneous laughter -- hence the title of the anecdote "Kokei sanshou" or "The Three Laughers of the Tiger Ravine." It is this moment that is usually depicted in paintings. The story probably originated with the late Tang Chan (Jp: Zen 禅) poet Guanxiu 貫休 (Jp: Kankyuu 832-912). Variations on the theme stress that the three men represent China's three creeds --- Confucianism, Buddhism, and Taoism --- and that in the instant that they crossed the bridge all were enlightened in that they realized narrow adherance to one philosophy or religion was contrary to true wisdom. In this way the theme is related to the similarly ecumenical subjects *Sankyou 三教 and *sansan-zu 三酸図 Notable illustrations include works by Ma Yuan 馬遠 (Jp: Ba En, late 12c), and, in Japan, by Chuuan Shinkou 仲安真康 (mid-15c), Shoukei 祥啓 (late 15c, Kohouan 孤逢庵, Daitokuji 大徳寺), Kanou Sanraku 狩野山楽 (1559-1635, Myoushinji 妙心寺) and Ike no Taiga 池大雅 (1723-76, Manpukuji 万福寺), Kyoto. This sign, hung on walls, will confer upon people a peaceful, balanced, and healing vibration; because the sign represents peace, healing, balance, love, and power. For details and testimonials about its power go to Tao of Mastery. Yin (black) and Yang (white). 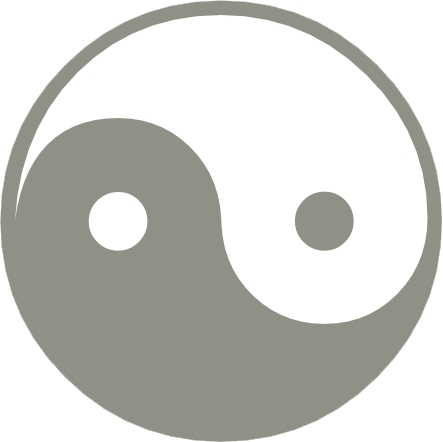 The two inner dots represent Yin within Yang and Yang within Yin. Around the circumference are shown the eight trigrams (bagua), which in this case represent different stages in the cycles of increase and decrease of Yin and Yang (clockwise from the lower left corner: zhen, li, dui, qian, sun, kan, gen, and kun). Source: Hu Wei (1633-1714), Yitu mingbian (Clarifications on Diagrams Related to the Book of Changes; 1706), chapter 3. In the most general way, Taoism may be defined as a traditional form of thought and religion, based on some central notions, cults, and practices but never subject to systematization as a whole, and syncretic but at the same time self-contained--in the sense that it integrates many elements from other traditions, but frequently emphasizes its distinction from them. These basic features underlie different formulations of doctrinal notions and a large variety of practices, ranging from self-cultivation to communal rituals. The main early Taoist text is the Daode jing (Scripture of the Way and its Virtue), a short work consisting of aphorisms attributed to Laozi (the Old Master, or Old Child). Although some scholars have suggested that other sources might be slightly earlier, virtually all movements and lineages within Taoism consider this as the founding scripture of the entire tradition, even though they may venerate their own texts and their own founders. Another early work, the Zhuangzi (Book of Master Zhuang), has provided Taoism with doctrines, notions, and technical vocabulary throughout its history. Despite differences in emphasis, the two texts present the same view of the Dao and its relation to the world. The word dao has two main meanings, namely "way" and "method." The early Taoist texts are the first ones to use this word to mean the Absolute. For the Daode jing, the Dao has no name and is beyond any description or definition; the word dao itself is used only because one "is forced" to refer to it. The Dao is unknowable, has no form and therefore does not undergo change, is "constant," and is "invisible, inaudible, and imperceptible." The two principles of Non-being (wu) and Being (you) are contained within it. Yet the Dao, in spite of its being "indistinct and vague" (huanghu), contains an "essence" (jing) that is the seed of the world of multiplicity. Under this second aspect--which can be distinguished from the previous one only within the domain of relativity--the Dao is the "beginning" of the world and its "mother." The person who has "returned to the Dao" is called in the Daode jing the shengren, a term that in a Taoist context may be translated as "saint" to distinguish him from the Confucian "sage." As the highest realized human being who has achieved liberation in life, the Taoist saint has transcended the limitations of individuality and form; he continues to remain in the world of multiplicity until he has completely fulfilled his function in it, but from an absolute point of view, which is the one in which he constantly dwells, his self-identity is already null, for he is identified with absolute Principle. Death for him, therefore, is not even a change of state, for he has attained the state in which no change can occur. In the human world, he "practices the teaching without words" and "makes it possible for the ten thousand things to function, but does not start them." To a significant extent, the history of Taoism may be seen as a continuous restatement of the principles enunciated in the early founding texts. To an equally significant extent, its development has been marked by the adaptation to varying historical circumstances, the response to the needs and demands of different social groups, and the incorporation of notions, beliefs, cults, and practices derived from other trends of thought and religion. The process that led, in the second half of the second century CE, to the formation of the first major Taoist religious movement can only be understood in the light of the politico-religious ideals of ancient China, synthesized in the notion of Great Peace (taiping) and shared by different traditions including Confucianism. 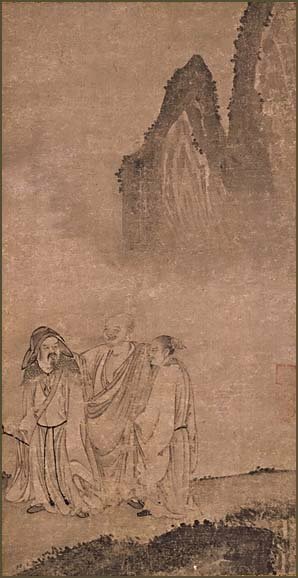 At the center of that process was the deification of Laozi, now represented not only as the sage who expounds the metaphysical doctrines of the Daode jing, but also as a messiah who embodies the Dao and reappears at different times either as a sage counselor of political rulers, or as the inspirer of religious leaders. 荳画蕗 The three teachings, i.e. 蜆￿ 菴￿(or 驥￿, and 驕鼎onfucianism, Buddhism, and Taoism; or, 蟄￿ 閠￿ 驥￿Confucianism, Taoism (aIso known as 逾樊侮), and Buddhism. In Japan they are Shinto, Confucianism, and Buddhism. In Buddhism the term is applied to the three periods of ﾅ堝〔yamuni's own teaching, of which there are several definitions: (1) The Jiangnan 蜊嶺ｸｭ School describe his teaching as (a) 貍ｸprogressive or gradual; (b) 鬆￿immediate, i.e. as one whole, especially in the 闖ｯ蝴ｴ邯￿ and (c) 荳榊ｮ￿or indeterminate. (2) 蜈臥ｵｱ Guangtong, a writer of the Iater Wei dynasty, describes the three as (a) 貍ｸ progressive for beginners, i.e. from impermanence to permanence, from the void to reality, etc. ; (b) 鬆￿immediate for the more advanced; and (c) 蝨田omplete, to the most advanced, i.e. the Huayan as above. (3) The 荳画凾謨子.v. (4) The 蜊怜ｱｱ Southern school deals with (a) the 諤ｧ遨ｺof Hﾄｫnayﾄ］a; (b) 逶ｸ遨ｺof Mahﾄ【ﾄ］a; and (c) 蜚ｯ隴伜恣 the perfect idealism. v. 陦御ｺ矩￿荳ｭ 4. Tiantai accepts the division of 貍ｸ, 鬆￿ and 荳榊ｮ￿for pre-Lotus teaching, but adopts 貍ｸ gradual, 鬆￿ immediate, and 蝨￿perfect, with the Lotus as the perfect teaching; it also has the division of 荳芽酪謨￿, 騾壽侮 , and 蛻￾謨￿q.v.